December is usually a busy month for the band, and this year was no exception with three gigs rounding off another great years playing and singing. 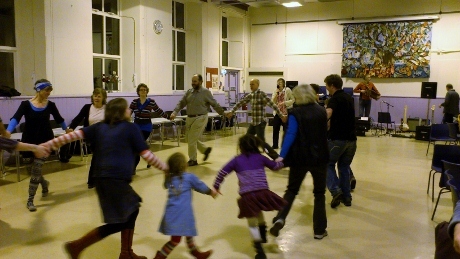 The first ceilidh was a return booking for the fifth time playing at the annual Crook Morris Christmas Ceilidh in the Kendal Parish Hall. The band were again augmented by a brass front-line of alto and tenor saxophones, and what a great night it was. Thanks must go to Pete our sound engineer for producing a good clean sound in a hall that can be problematical. 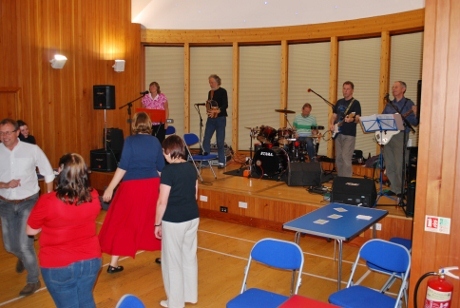 More great news is that the band have also been asked to play again at the 2013 ceilidh. Comments from Gill, the Crook Morris Squire, afterwards - There was a wonderfully dramatic start to the evening with Tumbling Tom. For their opening number they stood on the dance floor singing in near darkness in their red costumes and a few LED lights. 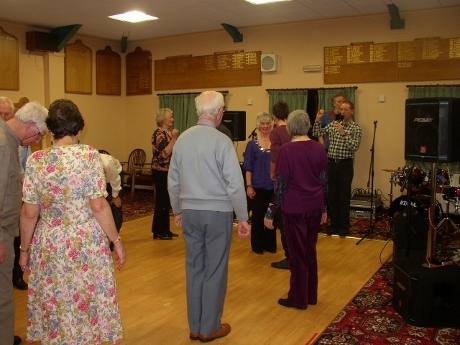 With their two callers, Fiona and Les, they provided varied dances for the rest of the evening and the floor was always full with enthusiastic dancers. Dressing up for this special occasion, we started off by singing a seasonal song called 'Lord of Misrule', written by Steve Tomlinson our guitarist. Fiona and Les took turns in calling the dances as usual, and included a rant, a chapelloise, and a circular form bourree in the dance selection. 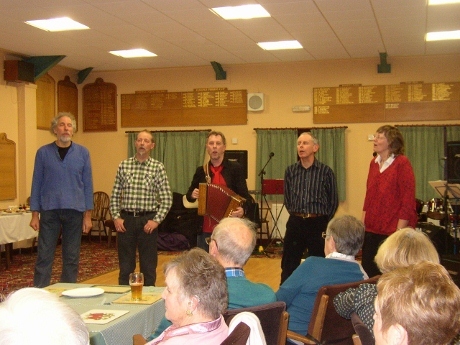 Enjoying themselves below are Hugh on melodeon, and Steve and Tony on guitar and bass guitar. The horn section of Kathleen on Alto Sax and Jennifer on Tenor Sax contributed a great sound, and added to what has become a very special night in the bands calendar. 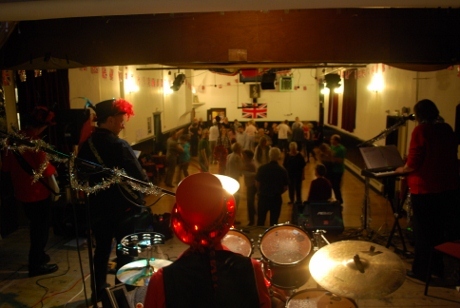 The people from Crook Morris made a fantastic job of decorating the hall, and having it full of dancers for our playing was great. A rapper dance in the dark - very spooky! The band then followed the Crook Morris ceilidh with a trip down to Poynton near Stockport for a night at their series of monthly ceilidh's. We continued the Christmas theme by wearing red, and by starting the evening by singing two verses of 'Deck the Halls' before playing the tune as an opening polka. 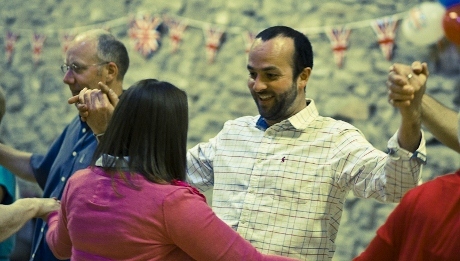 Great to see dancers responding by dancing a polka round the room. We included a rant (The Rifleman), a chapelloise, and a circular form bourree in the dance selection, and started the second half by singing Steve's song 'Lord of Misrule'. A very enjoyable evening, and thanks to Howard and the rest of Albireo for booking us. 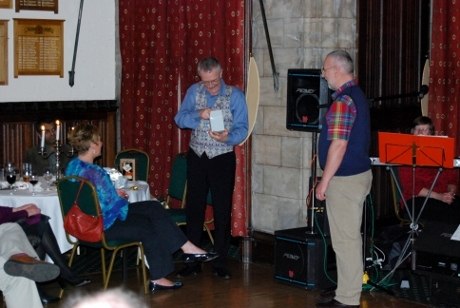 Howard said afterwards - It was a great evening and everyone seemed to be enjoying themselves. We'd certainly be glad to have you back at some future date. 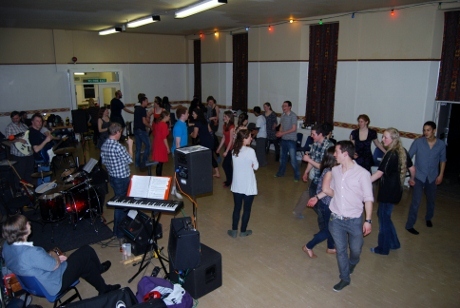 A band's (minus Hugh) eye view of the dancers early in the evening with the room still filling up. Fiona calling a dance to a crowded dance floor. 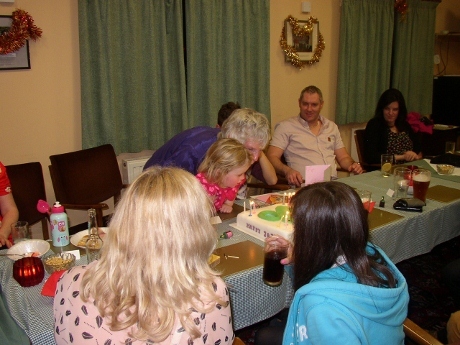 The last booking of 2012 was playing for Ellie's special birthday party at Grange Fell Golf Club. 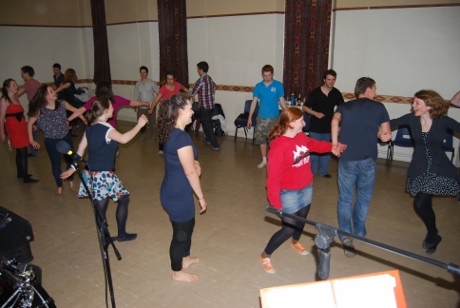 One of the dancers said afterwards - It was a great evening and your group are excellent. Thanks to Ellie for asking us and to Margaret for the photos. 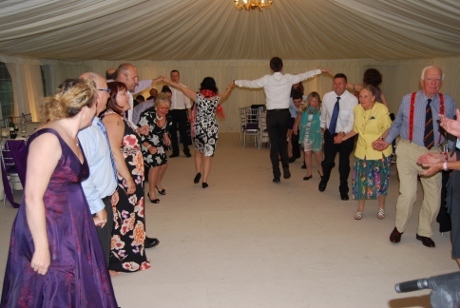 The dance floor was always full of people, and here is Les walking the dancers through a dance. 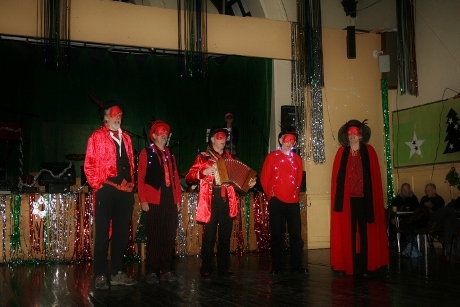 To give the dancers a rest, we gave them a rendition on Steve's song 'Lord of Misrule'. Here is the birthday girl herself blowing out the candles on her cake with help from one of her grand children. Happy birthday Ellie! For the first of three bookings in October, the band travelled over to Hornby and the by now familiar Hornby Institute. Laura had invited us to play for her wedding to Paul, and a good night was had by all, though I'm not sure that the hog being roasted would have agreed! Thanks to Laura for inviting us. 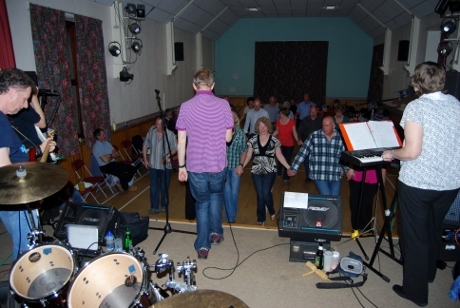 The next booking was a return to Priest Hutton Village Hall where the band have played many times to help the village celebrate Burns Night. 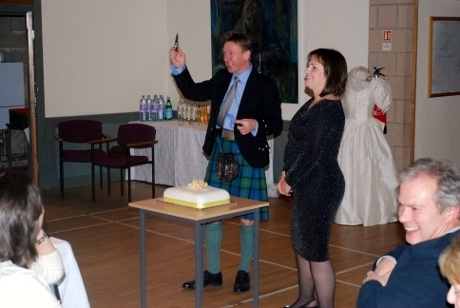 The master of 'addressing the haggis' on many of those occasions was Eric Rooney, but on this occasion it was to help him and his wife Hilary celebrate their silver wedding. Eric commented afterwards - Everyone really enjoyed the event and were very complementary about your playing and calling. Even the younger ones enjoyed it. Just shows that traditional music and dancing still have a place in the days of smartphones, texts and tweets. Below left shows them preparing to cut the cake, and below right the dancers enjoying a 'flirtatious' movement in one of the dances. Thanks to Eric and Hilary for making us feel so welcome, and happy anniversary! 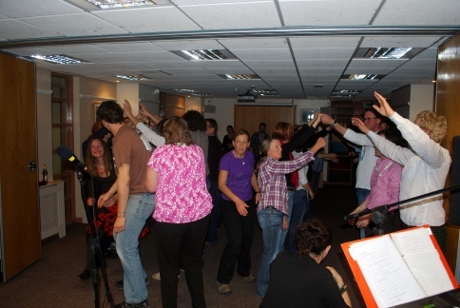 The final ceilidh of the month was another return visit, this time to the Derwent Hill Outdoor Centre in Keswick. 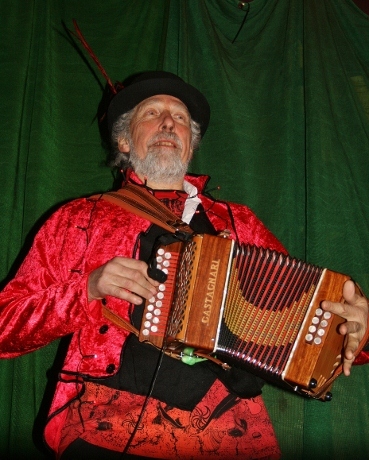 The centre was hosting a European wide conference on the outdoors, and Steven Lenartowicz as Centre Director booked us to provide the end of conference entertainment. A very enthusiastic group of fit youngish people made for a great nights dancing, and as the evening was going so well the band kept playing beyond the official finish time. Thanks again Steve for a great night. Steve e-mailed later - Everybody really enjoyed your session on Monday night. Could you please pass on my thanks to all the band. 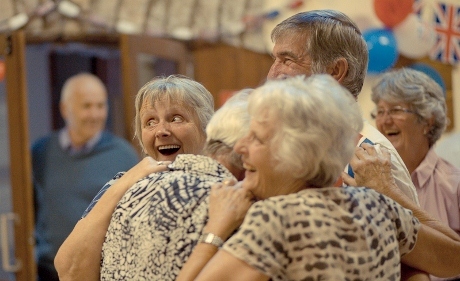 One of the locations that Steve teaches tai chi in is the lovely Ambleside Parish Centre, and the secretary of the centre asked the band if we could play for their annual get together of all the groups who use the centre. Advertised as " Party time! 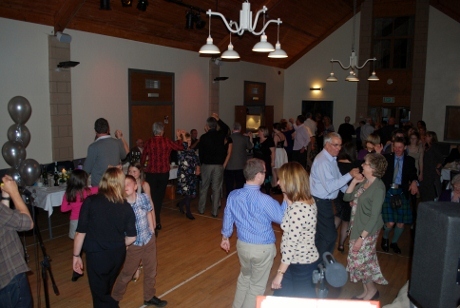 AGM, with Ceilidh and Hog Roast" the event was well supported and all enjoyed some great dancing. Thanks to Helen and her team for a very enjoyable evening. 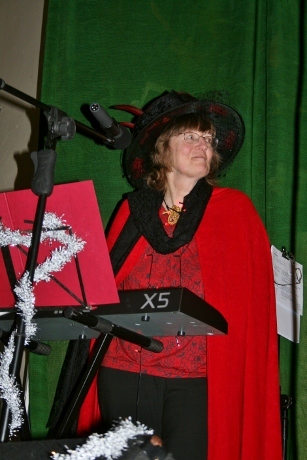 Helen said afterwards - Could you pass on our thanks to all your superb band for their hard work last night. The murmurings are already out though that we should have another (at a weekend though!) so watch this space! 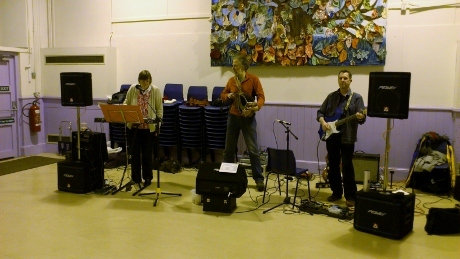 The band are pleased that they have been booked by Poynton Ceilidhs to play at their christmas dance on December 15th. Along with the Crook Morris christmas ceilidh in Kendal on December 1st, and a special birthday party on December 28th in Grange, they should make a nice end to the year. The first of our September ceilidhs was unfortunately cancelled, but in the meantime Hugh and Steve have been asked to play some local music by Taffy Thomas at the launch of his new book "Cumbrian Folk Tales" at the National Trust property Allan Bank in Grasmere on Thursday September 7th. The intention is to play a selection of tunes from the tune books of William Irwin of Elterwater, Matthew Betham of Towcett near Shap, James Lishman and John Wilson from the Browne collection at Troutbeck, and John Rooke from Wigton. Hugh has recently completed work for the Village Music Project on the Mathew Betham tune book from Towcett near Morland, and the results can now be seen on the Village Music Project web site here. Click on the name for background information on Mathew Betham, and on ABC for the tunes coded in abc. Note that you will need special (free!) software to convert the abc to conventional music notation. 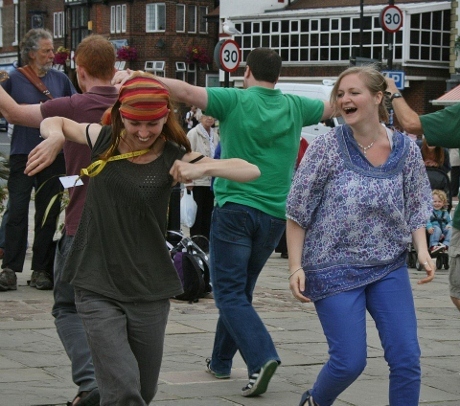 Most of August was spent at various folk festivals including Sidmouth and Whitby. 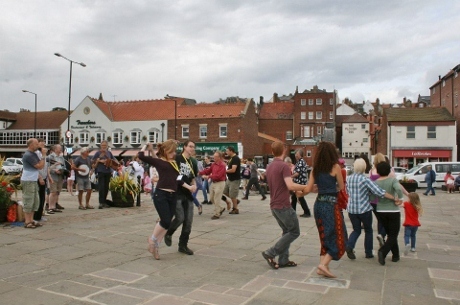 Shown are three photos of a 'flash mob ceilidh' at Whitby, with Hugh in the band, and Fiona and Martyn Harvey sharing the calling. See also this video on Youtube. Fiona's husband Pete is now a full time luthier and is currently focusing on the Swedish nyckelharpa. 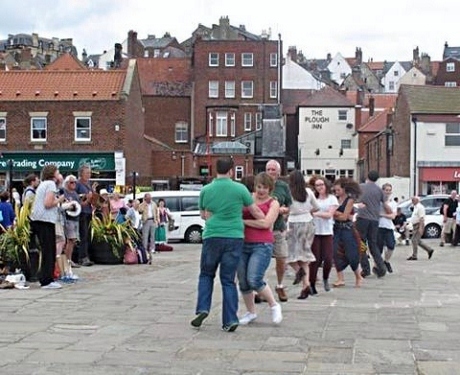 The video here shows Fiona and Pete (on the right) playing Pete's instruments at Whitby, with Vicki Swan and Jonny Dyer plus Daniel Wolverson also on nyckelharpas. The band are currently working with Bob Ellis, who lives in Gayle near Hawes, on a Dales Music Project. Bob has obtained copies of field recordings taken in the middle of the last century, of local musicians talking about the dances they played for, and playing the tunes they used. It was from the original recordings that tunes like Kit Whites 1 and 2, and Bill Hall's 1 and 2 came from. What became known as Kit Whites No 1 can be heard here, with Kit himself playing the tune. The Diamond Jubilee! Not ones to miss out on a good party, the band drove over to Scales near Ulverston for a village knees-up. There was lots of bunting and union jacks in evidence, plus a scarecrow competition during the day. 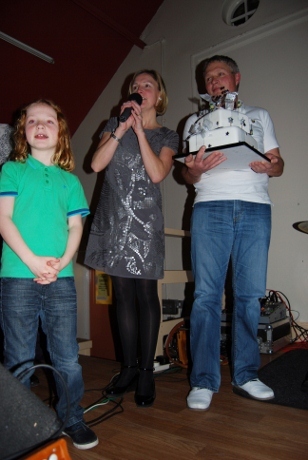 We even had a visit by the 'Queen' and the 'Duke' to announce the winners of the various competitions. 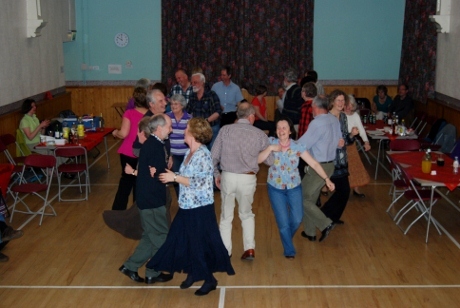 A great village atmosphere and excellent dancing made for a very enjoyable evening. 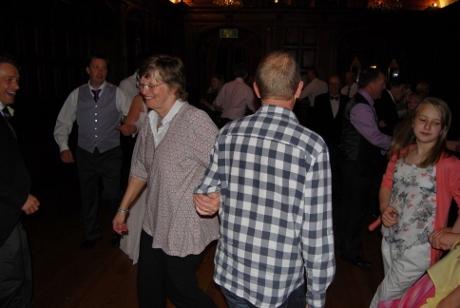 Thanks to Tom Sedgwick Price for the photos below of the dancing during the evening. Playing at weddings is always special, sharing in a joyful occasion. 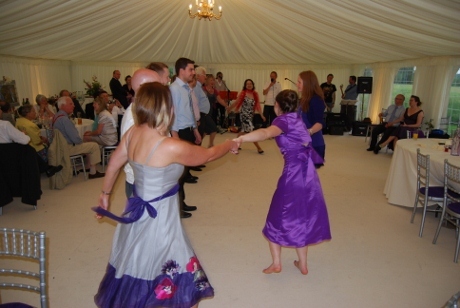 This wedding was on the edge of Witherslack village in a marquee on the bride and groom's house. 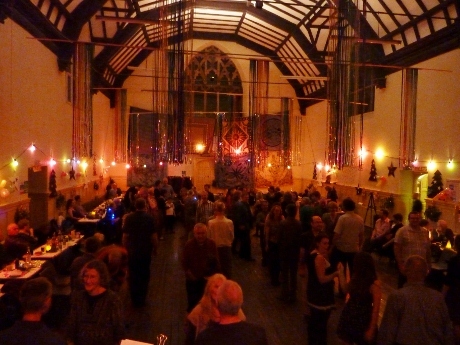 Despite the recent rain, the venue was a delight and a great evening was had by all. The Castle Green Hotel in Kendal is another one of our regular venues, and on a lovely warm evening we had the honour to play at the wedding of Angel and Mathew. The booking came about as Angel's parents used to enjoy dancing to the band at the annual Priest Hutton Burn's Night ceilidh's. 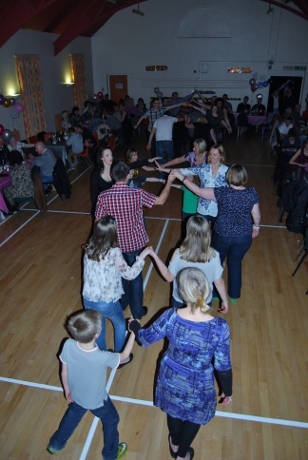 Angel and Mathew are shown here with their families and friends enjoying dancing 'The Riverside' dance. Just to thank you all for a great bash last night. Everyone I spoke to said it was great fun. Might see you again in the not too distant future. Just a note to thank you and the band for the most enjoyable dancingnnabel and Richard's wedding on Monday at the Netherwood. It was enjoyed by all and totally right in every way - you gave us variety and showed patience with the 'remedial teams'!!! Many thanks for your part in making the wedding such an enjoyable occasion. Every good wish and thanks to you all. Janet( Thompson) - as Annabel and Richard are on Skye at present! On the right, our two callers Fiona and Les are demonstrating how to strip the willow. March was a busy month with five bookings. 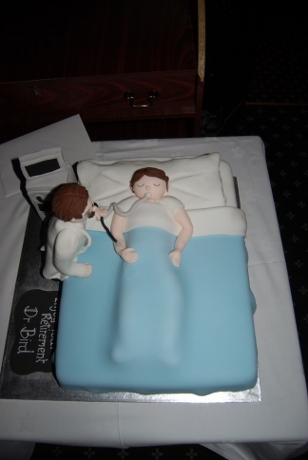 We started off with a return visit to Lancaster Golf Club for the retirement of Michael Bird as a consultant anesthetist from the Lancaster Hospital Intensive Care Unit. Obviously well liked by his colleagues, he had a great send-off and the atmosphere was warm and friendly with some great dancing. Right shows Mike's lovely cake, below left Mike being presented with an inscribed goblet, and below right the dancing getting uderway. Thanks to Mike for a lovely evening. Mike said aftewards - Please thank everyone. It was a great night for me and all the gang. 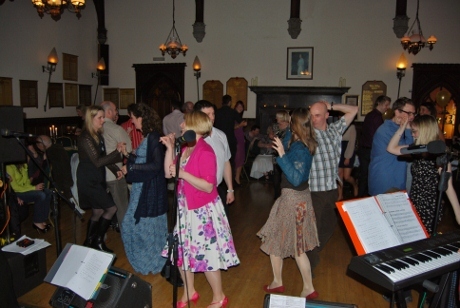 It all went even better than I had hoped and the ceilidh was brilliant. Your music was just as I hoped, different from the usual Irish/Scottish stuff, although I love all dance music. Many, many thanks. 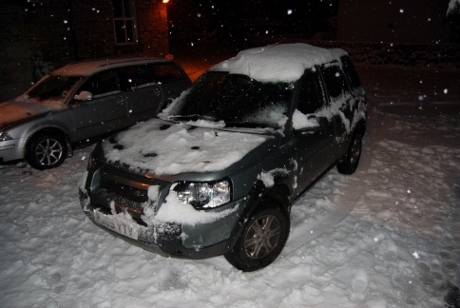 This was followed by a drive over to the Dalesbridge Outdoor Centre near Settle, where a group of medical students were on a weekend's wilderness seminar organised by Newcastle University. Having played in the hall previously, we were familiar with its unique acoustics, and managed to achieve a good sound. The students were great to play for and full of energy. Below left shows Les talking the dancers through a dance, whilst below right shows some dancers enjoying the Orcadian Strip the Willow. Thanks to Joanne and all the dancers for a lively and exciting evening. 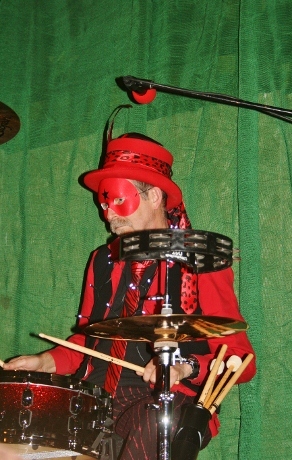 After that, we had three gigs in eight days. First of all, we played at Stramongate School in Kendal for the Lib-Dems - right. Thanks to Sylvia Emmott and her team for an enjoyable evening that included food. Then in the middle of the week we drove over to Coniston to play for a yoga course: a good night for a small select group. At the end of a busy week, we played and sang for Arnside Choral Society in the Arnside EI Hall. 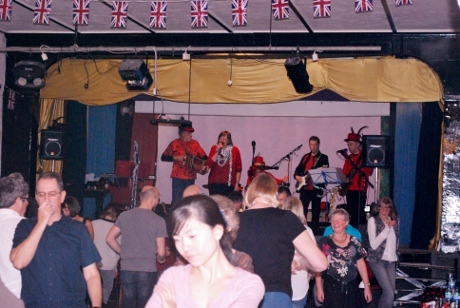 Below left shows the bands view of the start of the Cornish Six Hand Reel with Les calling, and below right the dancers enjoying the Circle Schottische. We were booked for the third time to play at the annual ceilidh of the walking and climbing club K Fellfarers at the Castle Street Centre in Kendal. It just happened to be the evening when a lot of snow arrived, and two of the band members couldn't make it. It is a testament to the conditions that this was the first time in the bands 30 years history (not always the same line-up) that we haven't managed a full turn-out. As it happened, only half of the 90 members who bought tickets managed to make it through the snow, but it was a good night nevertheless. Right shows the snowy car park with Hugh and Steve's cars. 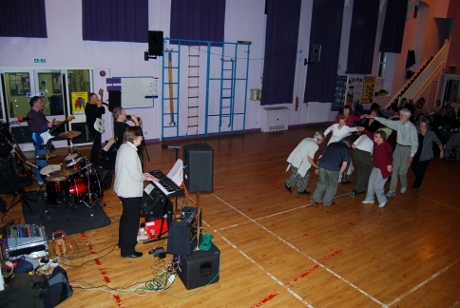 Below left is the depleted band, and below right the dancing getting underway with all ages present. 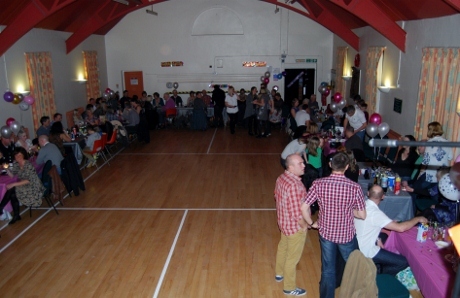 We started 2012 with another visit to the excellent Hest Bank Village Hall, our 3rd in 12 months, to help Anthea celebrate her 40th birthday. A lively evening with lovely people made for an excellent start to the year. Thanks to Anthea and her family and friends. 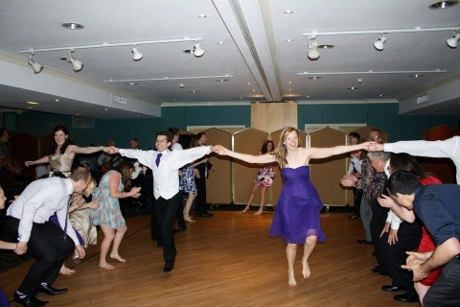 Left shows the hall before the start, and below left the dancing underway with the 'Double Gloucester' dance. Below right shows Anthea with her husband and daughter, giving a short speech after blowing the candles out on her lovely cake. 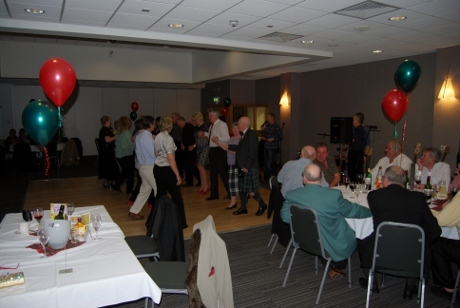 This was followed by a return booking at the Globe Arena in Morecambe for a Burns night ceilidh. The guests were welcomed in by the piper who then processed in with the haggis and addressed it in style! After the meal it was great to see the enthusiasm of the dancers and to watch the pleasure of the listeners as they joined in with clapping and foot tapping. Many thanks for a very enjoyable Burns celebration (and the delicious haggis)!